Seoul is a city that has its soul buried a little below the surface. Blocks of blacked out 4 x 4s and Bentleys cover the 6 lane roads, swept clean, kept to its utter bare concrete. Everybody keeps to themselves, contained in their sphere with a grim, fierce and stoney face. Its people - the men and women some of the most beautiful in the world- appear far colder than that of any Asian country I have ever been. Polar opposites of the Vietnamese whom I feel are like the Italians of Asia. I have come to Seoul more often than I can count with both hands for my Love Leluu boutique – my passport, full of Incheon’s customs stamps and I have a pocket full of bad memories as well as good ones. As my relationships with my suppliers grow with each journey building a stronger and stronger bond. I have discovered that you have to unravel the Koreans, you have to earn their trust, merit their warmth and win their smiles. A contest that can come across as quite difficult but one must and should persist. I have the same relationship with Korean food. Introduced to it in London, by a lovely Korean friend, Jisook – who always called me her sister: ‘Ran’ – in Great Marlborough Street, Soho became a regular treat as I have had the most amazing food. Korean – being right up there on my top 3 cusines. It is Korea’s most typical dish -kimchi – fermented cabbage in this pepper sauce – a strong and dominant pickle that gets to me, makes my stomach raw and acidic – repeating on me through my pores and in my breath for days and days afterwards. No wonder Seoul smells a bit like damp cloth. This kimchi and this red pepper sauce lingers above many culprits like a invisible vapor – hard if you were pregnant or stuck in a lift! Kimchi comes with everything and I see people order JUST kimchi with noodles or with rice! How could you…? 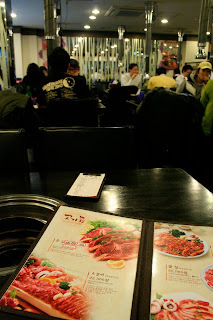 Putting stinky kimchi aside, I do love the Korean Barbeque – I mean, how could you not? It is one of those things in life that is a real pleasure, a real treat and in Korea, this is what I look forward to most. My favourite is 'bulgogi'- tender beef, marinade in soy sauce with sesame oil, sugar, onions, garlic, black pepper, rice wine vinegar. I heard that what makes it ever so tender is blended kiwi and onion. I usually order a rib of this, and it comes with so many accompaniments to make your entire meal, including kimchi. You use the salad leaves as a wrap, fill it up with pickles, onions, rice or whatever you are offered with some meat from the barbeque, roll it up, dip it in one of many sauces on the table and you can end up eating half an animal by the end. Surprisingly, even with a little kimchi makes it all very tasty. Wash it all down with my favourite beer – Hite and we’re on our way! 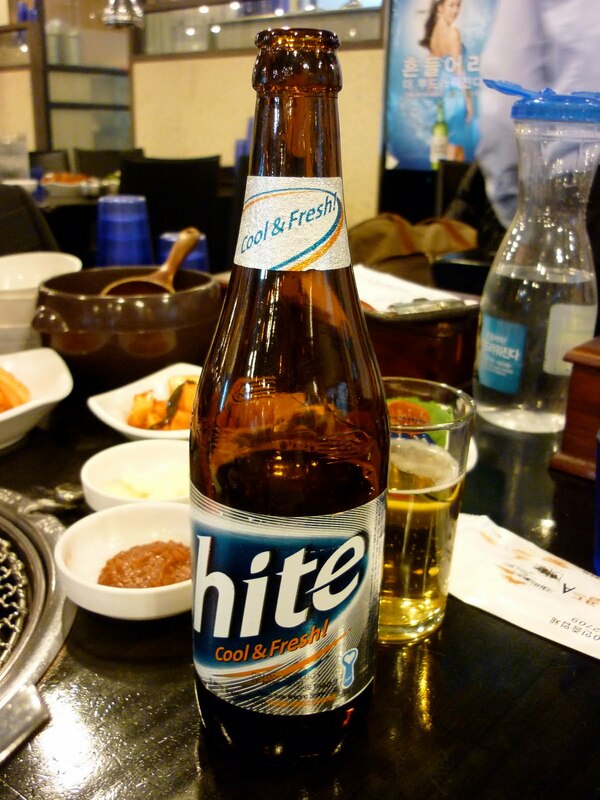 ‘Hite’ is a light and refreshing beer which is perfect for all the meat you could eat at a barbeque. It is made with Spring water but has quite a high alcohol content. 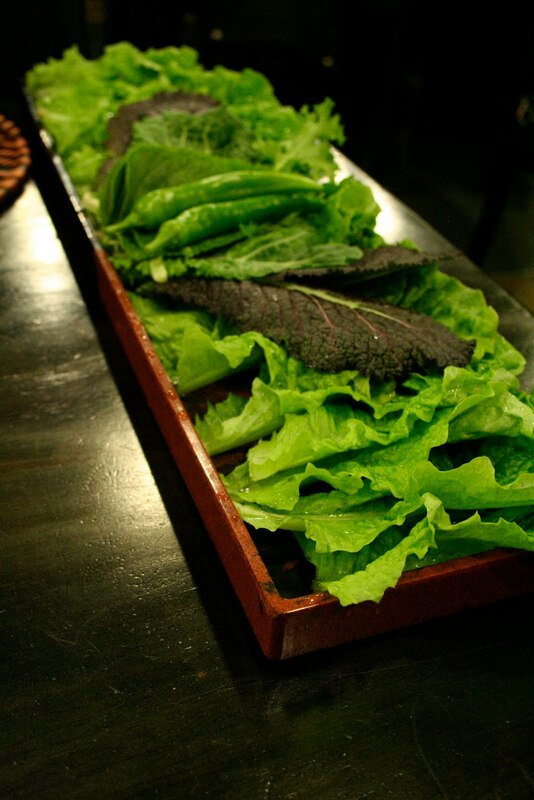 I have taken my mum to Seoul once, and she absolutely loved it – the salad wraps – Korean fajitas! I also took Simon who really loved the barbeque and especially the beers! ‘Cass’ beer is also really nice. My other most favourite meal is ‘bibimbab’ – it is most delicious when made well of course as you can get many variations. It is normally cooked in a stone bowl, with rice, pickles, minced meat and a fried egg on top. You mash it all up with red pepper sauce and it is really delicious. I have had really nice red pepper sauce and really bad ones – like anywhere and any foods, some people can make it really well, some others should give up! As a foreigner, I feel the people, like the food is masked yet once you reveal it, it is so complex and beautiful – you just have to get to know it – it doesn’t just wear its heart on its sleeve. It has no interest in seducing you, you have to seduce it and that’s where you find the most pleasure – Just like this post reveals, I do not like kimchi or this red pepper sauce, but I do find that I do like it - actually! I never used to like going to Seoul very much – although I always enjoy my work there, but that was because I didn’t really understand it. I still don’t, but slowly slowly, I am coming around.